Gallery190 is a rotating art exhibition space within the Memory and Aging Center offices. Gallery190, sponsored by the UCSF Memory and Aging Center (MAC), is located in the Sandler Neurosciences Building on the Mission Bay Campus of the University of California, San Francisco (UCSF). The gallery is open weekdays 9 to 5 p.m. and weekends by appointment. When the MAC moved to the UCSF Mission Bay Campus in 2012, we immediately imagined art hanging in the beautiful reception area of Suite 190. Our inaugural art show opened in late 2012 with an exhibition of the watercolors of William Yokoyama. Deborah Aschheim, Hellman Visiting Artist from 2009–2011, has four prints and the A.W. Clausen Memorial on permanent display within the gallery. Gallery190 exhibits are typically on display for three to six months. Depending on the number of pieces to be displayed, there are additional walls within the suite that may be available for an exhibit. For information and to view the gallery space please contact Leslie M. Goss, Assistant to Bruce Miller, MD, at 415.476.5591 or [email protected]. Please click here to download a map of the gallery area. 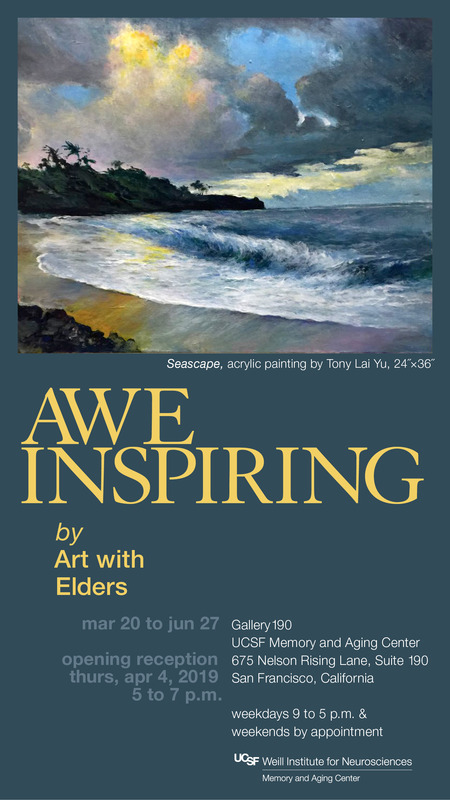 “AWE Inspiring” by Art with Elders (AWE) will be on display from March 20 to June 27. The opening reception is on Thursday, April 4, 2019 from 5 to 7 p.m.
Gallery190 is open weekdays 9 to 5 p.m. and weekends by appointment. Art with Elders (AWE), sponsored by the San Francisco non-profit ElderGivers, provides older adults who live in San Francisco Bay Area long-term care facilities an opportunity to explore and to develop latent artistic talents. Every year more than 1,500 art classes are taught by professional artists from around the Bay Area. There are groups of up to 12 students, some of whom are in their eighties and nineties, who meet weekly to learn new skills and create art. Some students are first-time artists.